This machine is suitable for laminating printed cardboard and corrugated cardboard (corrugated paper track-A.B.C.D.E.F.N, 3ply, 5ply and 7ply).It is an ideal machine for mass production of cartons and package boxes. ●Completely automatic conveyance of surface printed cardboard and base corrugated cardboard. 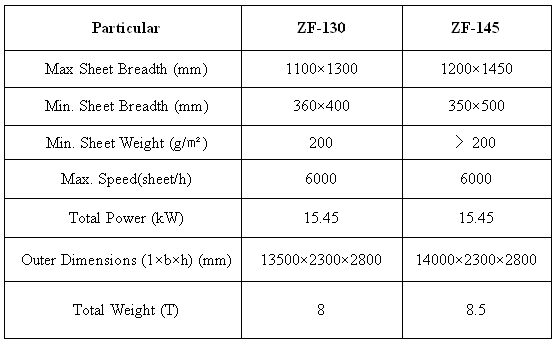 ●Maximum thickness of base cardboard is 6mm. ●Easy adjustment for different sizes' cardboard with gauge on the machine for adjusting reference. ●High production efficiency with max speed of 6000 sheet/h.